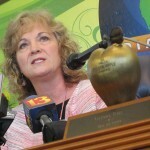 House Republicans Thursday blocked Democratic lawmakers’ attempts to ensure State Superintendent Glenda Ritz can’t lose her position as chair of the State Board of Education. The proposed bill would allow the gubernatorially-appointed members of the State Board to elect their chair, a position that’s been automatically held by the state Superintendent for more than a century. 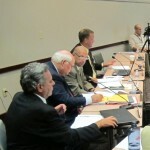 One amendment offered by House Democrats would have kept Ritz as automatic chair; another would have allowed the public to elect all members of the board, and a third amendment would have made local school boards part of the process of appointing State Board members. House Republicans rejected all three. Floor debate became a little heated…so much so that House Speaker Brian Bosma had to rein in Minority Leader Scott Pelath. “You were mad that she won; you had to get revenge. You couldn’t take it; you couldn’t handle the dissenting view,” Pelath said. “If I can, Representative Pelath – I know you feel passionately about this,” Bosma said. “But you’re desperately close to impugning the motives of those who are bringing the bill forward in violation of Rule 41.1,” Bosma warned. “I’ll dial it back a notch, Mr. Speaker,” Pelath responded. Republicans say the issue is not about politics or personalities; they say continued dysfunction at the State Board requires a change in structure. The bill will be available for passage by the House next week.